Susan G. Komen for the Cure has become a bloated Cancer Awareness McDonald's that offers more swag and socialization opportunities than cure. But just because Komen's managed to portray breast cancer as a feathery pink celebration of sisterhood and not a disease best fought with patient empowerment and scientific understanding doesn't mean that every breast cancer charity is in the same boat. Here's how you can help support the search for the cause and a cure without giving money to Komen. Even after pouring billions of dollars into raising "awareness," we're no closer to understanding the causes of breast cancer than we were decades ago, and treatments haven't acceptably advanced. That's where Breast Cancer Action comes in. Formed in 1990 by a group of breast cancer survivors, the group aims to "inspire and compel the changes necessary to end the breast cancer epidemic." They do this by approaching breast cancer as a social justice issue as well as a public health concern and pressuring local governments and regulatory bodies to develop less toxic breast cancer treatment options and understand what causes the disease. The charity provides a 24-hour support line for anyone affected by breast cancer to use as a resource. This group puts its money where its mouth is as well and refuses to accept money from corporations that profit from or contribute to the breast cancer epidemic. This means no big pharma, no chemical manufacturers. Breast Cancer Action's executive director Karuna Jaggar minces no words in saying that the status quo is not going to end the breast cancer epidemic. "A cure is not enough," Jaggar told me. "We have to prevent it. The cures we have aren't working." BCA is behind the 'Think before you pink' campaign, which demands transparency in pinkwashed product marketing, as well as the FDA's revocation of approval for Avastin, which was not shown to increase survival among breast cancer patients but was being marketed as an anti-breast cancer drug, anyway. According to Andrew Becker at the American Cancer Society, donations intended to be used for breast cancer research and screening can be earmarked "breast cancer," and in that case, your donation will go toward supporting a number of programs. NBCCEDP (the National Breast and Cervical Cancer Early Detection Program) is a program that aims to provide breast and cervical cancer screening, care, and follow-up to women considered "high risk"— especially low income and "racial and ethnic minority women." To date, 10 million exams to 4 million women have detected 52,000 cases of breast cancer. Another breast cancer-specific program at the American Cancer Society is the Deep South Disparities Project, an initiative that aims to work with communities in the southeastern portion of the US to eliminate screening and health care disparities among men and women of the region. They've also partnered with Wal-Mart to provide grants to communities in need. Finally, for the last decade, the ACS has focused heavily on social disparities as they relate to cancer diagnosis and treatment. They've awarded more than $113 million in grants to researchers looking into social disparity as it relates to cancer, and some of their findings have already been published. The NBCC was founded in 1991 and has set a deadline of January 1, 2020 to end the disease forever. According to the organization's website, they aim to promote research into causes of breast cancer and the best possible treatment for the disease, access to treatment for all women, and encourage breast cancer advocates to speak up and stand up against the disease. They're largely a lobbying organization focuses on policy advocacy and increasing the amount of federal funding that's awarded to breast cancer research. While the Susan G. Komen foundation has raised about $1.9 billion for breast cancer over the course of the organization's 30-year existence, last year the NBCC convinced Congress to award more than $2.1 billion to breast cancer research. And they did it without the middleman. Ninety cents of every dollar donated to the Breast Cancer Research Foundation goes to supporting, well, breast cancer research. It seems like a no-brainer, but Komen only gives about 20 cents per dollar to research, and only 3 or 4 cents of that 20 cents goes to actually researching environmental causes of breast cancer. The BCRF was founded by an executive from Estee Lauder. 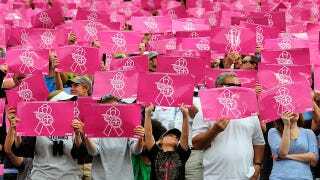 The organization currently funds 186 scientists worldwide and has raised over $350 million for breast cancer research. The youngest of the organizations on this list, Unite For Her aims to help breast cancer patients integrate other therapies that would complement the care they're being given by their doctors. Think acupuncture, massage, yoga, counseling, and other treatments that address a woman's spiritual and emotional needs during what could be a long and difficult fight against cancer. The organization's aim is to "educate, empower, and restore," which sounds like words that would be sponge painted in a youth minister's kitchen, but actually sounds kind of neat. One of the services they provide breast cancer patients are "Wellness Days" where they're given massages, yoga sessions, and meditation to help them feel better. According to Breast Cancer Action's Executive Director Karuna Jaggar, breast cancer isn't overfunded; its funding is poorly allocated, being spent on organizational bloat and Nancy Brinker's first class plane tickets instead of actual patient advocacy. So if you'd like to donate to a breast cancer charity without having your good intentions turned into pocket padding, consider giving to one of the charities listed above, or making a case for your pet breast cancer cause in the comments below.